Bake a sheet cake the size that you need. With an icing filled bag and tip #5 draw Ruby on the cake top. Cut the cake away from the shape. You will be using the round tip #5 to do all the outline work, and the star tip #16 to do all the fill in work. Make a black icing and outline the entire cake. Fill in the white areas. Make a light pink icing and outline the band at the bottom of the princess hat. Fill in the band. Outline the design on the front of the hat. Using the light pink icing fill in the veil on the hat,the collar on the dress, and the band on the sleeves and the belt of the dress. 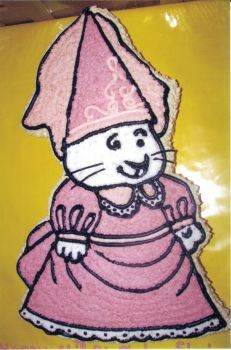 Make a medium pink icing and fill in the rest of the hat and the dress.